When FRSet4 is connected to the bike's intercom system, a two way radio and a Push To Talk (PTT) switch, both the Driver and Passenger can receive and transmit on the radio through their helmet headsets. If the bike's audio system is configured to mute the music when passengers speak into the intercom, then FRSet4 will mute the music when audio is received from the two-way radio. "What harness goes with the radio I have?" 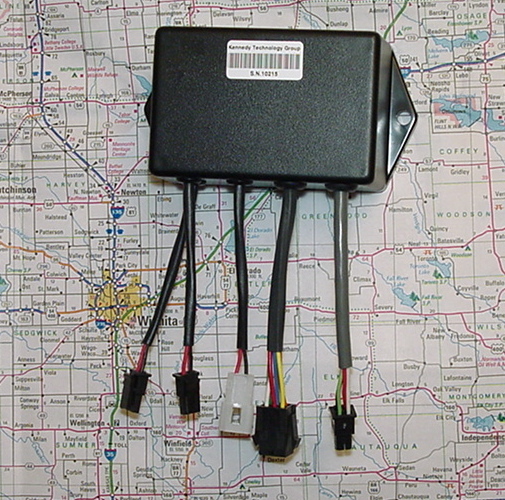 MSRP - USD 95.00 (FRSet4 Module and power harness only- PTT assemblies, Radio and Intercom Harnesses sold separately). All FRSet3 and FRSet4 harnesses are cross compatible.